Conveniently located in the Lahaina Business Park at 207 Kupuohi Street, Lahaina, Hawaii, West Maui Sail & Canvas can repair sails, awnings, dodgers, sail covers, and a wide range of canvas accessories quickly and at competitive prices. Our ground floor loft with drive up access will reduce the turn around time for Commercial Accounts from days, or even weeks, to just hours! We also offer Pick-up and Delivery services. Custom canvas and sail repair starts at $85/hour - please call for more details! a custom fitted canvas refrigerator cover with a matching bar cover for Merriman's in Kapalua (Pictured below.) The refrigerator has a functioning door flap that can roll up and be secured when the bartender is working by special request. We are well versed in manufacturing a variety of covers. 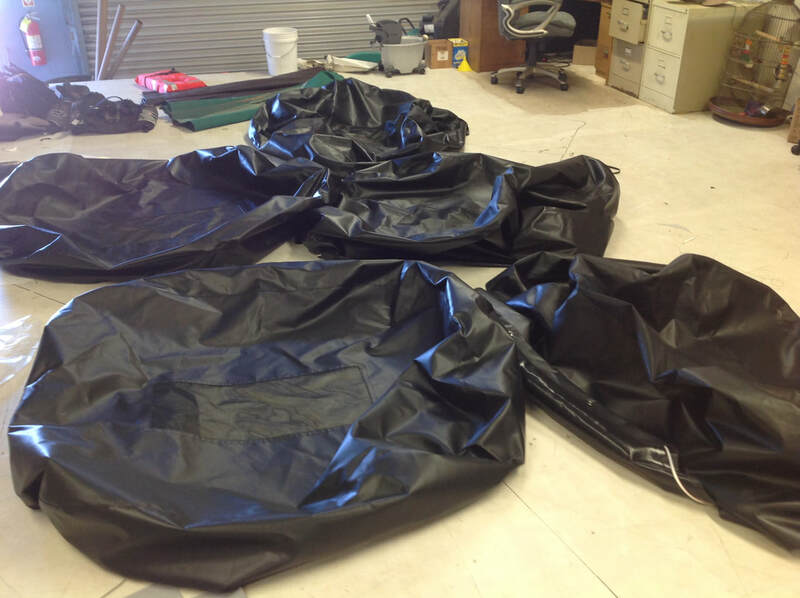 Last month, we built 6 vinyl life raft covers for the 65' Maxi Power Catamaran, Pride Of Maui.